This is perhaps the least documented fact about the training at Largo House. No other website I have come across has any detail on this at all, so it is my privilege to bring this forgotten fact back into public knowledge. Before I share a VERY EXCITING PHOTOGRAPH (Not In The Public Domain) with you, I want to tell you how I discovered a part of training at Largo House that no other website discusses and how I came to find this photo and the significance of it. Let's begin! 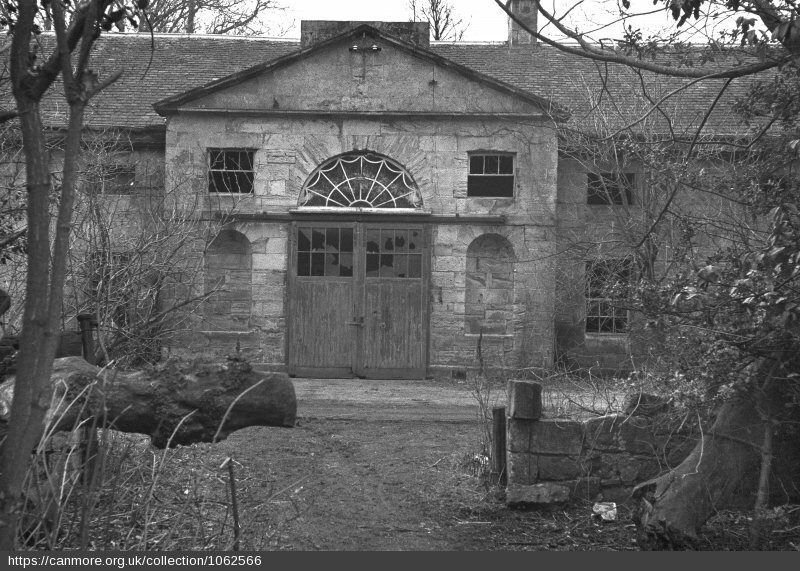 This is a photo of the stables at the back of Largo House, taken in 1971 by a surveyor. The training that happened inside those doors (specifically in the room to the left) was MOST interesting as you will see in a minute. During research on my grandfather, I was directed to a book written in Polish called "Lata Zanikajacej Nadziei" by former parachuter Zbigniew S Siemaszko. I managed to import a copy of the book from Poland, my initial interest in it was the chapter on his time at Auchtertool polish camp. However, he also mentioned a bit about Largo House. On Page 124 of the book, Zbigniew refers to "At the back of Largo house...in the Stables...we cut a hole in the ceiling and practised jumping throguh the hole in the ceiling and landing on mattresses below." - Holy Moly! I could not believe what I was reading, something that no-one has ever spoken about regarding Malpi Gaj. Now I had visited the Stables building quite recently and knew it was in an advanced state of dilapidation with no roof or internal structures of any kind... But I was dying to get any possible evidence or pictures of this piece of training equipment, such that it was. Fast forward a few weeks and there I am, browsing through the listings of a private archive in search of Largo House material. And then BAM! 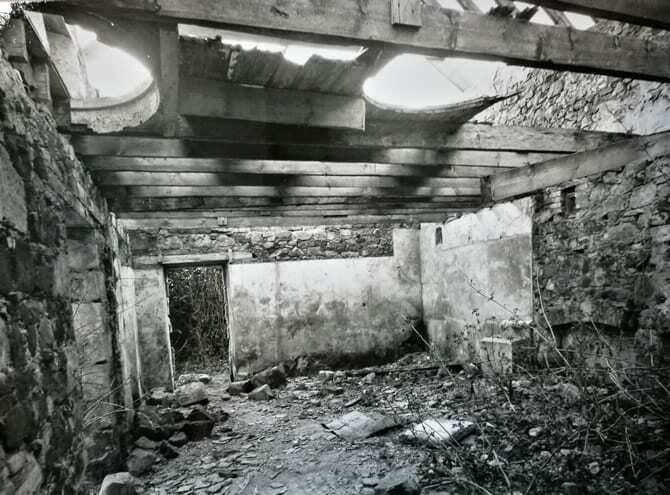 I saw a listing for several photo's taken by a surveyor in 1971 of Largo House. One of them simply said "internal photo of Stables at rear". One short phone call later I have managed to secure an appointment at the archives to view the photo. The day of the appointment arrived, I was trying hard to contain my excitement at the new discovery I might be about to make. I was shown to a table that had an archive box on it...this box was a treasure trove of Largo house material but the photo I was really looking for was just amazing. I was blown away by how much detail was in the photo, okay, so its just a badly cut hole in a ceiling, but my grandfather jumped through that hole as part of his training, as did several thousand other men. This is a very rare and exciting photo of the Whitley Bomber training hole (a phrase I coined!). Did they climb up the hole on the left and jump thorough the one on the right? Seems feasible! Stanislaw Jankowski gives a very interesting account of this hole: " In silent operations, we jumped through a hole in the floor. All art consisted of quickly slipping into this hole. We practiced it dozens of times at Monkey Grove from a good hole in the floor of an aircraft without wings, set in a hangar over a sawdust covered with a threshing floor." Stanislaw implies there was an aircraft fuselage at Largo House as well. Was there? I'm looking into this as we speak! A Whitley bomber was the preferred plane for the parachutists to jump from. However, it did not lend itself to being parachuted from, it was confined, cramped, could not be stood up in, had no seats and windowless in the area where parachutists would sit. To parachute out, a wooden hatch would be opened up, you would sit on the rim and drop out more often than not being pulled in the planes slipstream before descending. The Polish Parachuters at Largo House made a mockup of the Whitley bomber hatch. They did this in the Stables building at the rear of Largo House as detailed above. This was as close to the real thing as they could invent with practically nothing more than a saw. On the same page the above author refers to doing initial jumps from the parachute tower (at Lundin links) at the end of week one. So we can see the training was super-intensive covering physical fitness, learning to exit the plane correctly, learning how to control the parachute mid-air and learning how to land. On page 127 he refers to the training period being shortened to less than 2 weeks. earlier accounts state it was 4 weeks long so clearly changes to the period of training at Largo House were altered and it would appear the change to less than 2 weeks happened mid 1943. According to Zbigniew, he jumped from the 26 meter high tower a total of 12 times during training.